Abstract : The status of the vacuum vessel on February 2006 and some later improvemens are shown. Lower pressure and graphs of outgassing. During the development of the porcelain vacuum vessel  and due to the difficulties found, a copper vacuum vessel was developed. The chamber is made from standard copper gutter of 0.8mm wall. This thickness is less than the recommendation in Dolan and it could be calculated by finite elements as in . 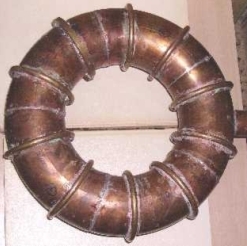 10 brass rings calculated to withstand 1/2 of the total force on the proportional area corresponding to the ring, applied on one side of the ring are soldered on the torus. Rings are made of brass rod of 8mm diameter. See Photo 1. At this moment two prototypes of porcelain vacuum vessel are successfully built but the copper device is the present line of development. The vacuum vessel made from 5 pieces of copper gutter has some disadvantages and advantages with respect to a porcelain one. One disadvantage are the internal virtual leaks from the joints that are impossible to avoid or to remove due to the small size of the device, so the outgassing seemed to be and is notable high and it decreases slowly as can be seen in Graph 1. The graph shows the evolution of the outgassing (the increasing part of the magenta and red lines). The blue line at the level of 600Pa was the result after the first connection of the mechanical pump. The other two lines are taken in the days specified in the graph using only the mechanical pump. After 3 days of outgassing without baking the outgassing was 6x10-4Pa m3/s. Because of this disadvantage a heater will be useful for a low temperature baking in order to speed up the outgassing rate. Under the last conditions the minimum pressure was under 0.5Pa. The value will be exactly know when the recently two units of Edwards Active Inverted Magnetron or Cold Cathode gauges are installed. They are ebay items without warranty, manuals or connectors so extra difficulties will appear. The Edwards Active Inverted Magnetron is installed and working. There were some difficulties to obtain the manual of the gauge from the Spanish representative of BOC Edwards, but the central offices in UK were very kind to help me. In the fist moment (the vacuum vessel has far less outgassing after 3 days of outgassing), the pressure in the system without the vacuum vessel dropped up to 5.5 x 10-3 Pa. So the objective of 10-2 Pa is achieved. The vacuum vessel after 3 days of outgassing (or after some baking) have similar outgassing rate than this present experience, so 10-2 Pa will be possible. - Change the oil of the diffusion pump, by now DC-704, and install DC-705 or fluorocarbon one. - Change the high vacuum valve from a bellows Varian valve to a gate valve and increase the piping to NW50 size. - Clean the vacuum vessel with some unknown process adequate for copper and after that fill the chamber with nitrogen when it is opened. * NW50 fittings are installed and the Varian vacuum valve and NW40 fittings are removed. The conductance has been increased to achieve improved vacuum in spite of the high outgassing and small leaks. This has been accurately calculated. AIM-S reached 8.90V in the vacuum vessel after 15 minutes. The pressure is 9 x 10-3 Pa .So the objective of 10-2 Pa is really achieved now. * A new low cost ebay Lam Tylan General capacitance gauge is added to the system. The item was out of order but a careful search revealed a damaged protection diode. * A correct calibration of the TC gauge at high pressure is done by means of Tylan gauge and at low pressure using the AIM-S magnetron. * Some overheating and oil spillage has been observed on the Pfeiffer roughing pump. It difficults long sessions of outgassing. * Because the "ultimate" pressure without vacuum vessel was 5.5 x 10-3 Pa a new analysis of the system is necessary if lower vacuum is required. - The mechanical pump reaches 4 Pa with difficult so it could influence in the ultimate pressure of the diffusion. - DC 704 has a vapour pressure at 25ºC = 1 x 10-7 Torr = 1.3x10-5 Pa that will be higher at the warm top of the diffusion pump. At present the calibration of the TC gauge is not possible because it is not clear if the vacuum is under 0.1Pa what is the condition of calibration of the TC gauge. The results in Graph 2 show 3 possible values taken at 17mA , 17.5mA and 18mA of current in the heater of the TC. The correct value will be between 0.4 and 0.05Pa because usually the 1518 TC has this range of heater currents as point of calibration. The vacuum is enough for a first observation of the quality of the magnetic surfaces and magnetic axis using excitation of the remaining air. Some information is available about past experiences of this type. 10-2 Pa was stated as the first objective in the vacuum system so the objective is not fulfilled yet. However it seems that could be reached. The inverted magnetrons need to be installed. Some new vacuum flanges, bellows and clamps are being shipped and will be installed. "Vacuum vessel for UST_1. Status and improvements" Vicente Queral , See "List of all past R&D" in this web. "FE stress analysis for a first outline of the vacuum vessel of UST_1" . Vicente Queral , See "List of all past R&D" in this web. Photo 1 . Copper vacuum vessel with reinforcements .